U.S. President Donald Trump holds up the document that he and North Korea leader Kim Jong Un just signed at the Capella resort on Sentosa Island Tuesday in Singapore. The most tangible outcome of the summit between President Donald Trump and North Korean leader Kim Jong Un seems to be a commitment to recover the remains of U.S. military personnel missing in action and presumed dead from the Korean War. In a joint statement signed by the leaders Tuesday, the countries committed to the recovery of the remains and the immediate repatriation of those already identified. 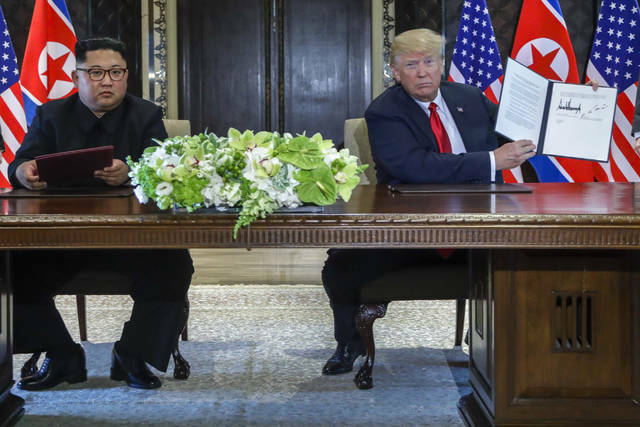 SINGAPORE (AP) — President Donald Trump wrapped up his five-hour nuclear summit with North Korean leader Kim Jong Un with surprisingly warm words and hope for “a bright new future” for Kim’s isolated and impoverished nation. Yet he immediately faced pointed questions at home about whether he got little and gave away much in his push to make a deal with the young autocrat — including an agreement to halt U.S. military exercises with South Korea. Soon, Kim was on a plane headed home, while a clearly ebullient Trump held forth for more than an hour before the press on what he styled as a historic achievement to avert the prospect of nuclear war. Before leaving himself, Trump tossed out pronouncements on U.S. alliances, human rights and the nature of the accord that he and Kim had signed. The details of how and when the North would denuclearize appear yet to be determined, as are the nature of the unspecified “protections” Trump is pledging to Kim and his government. The White House did not immediately respond to the North Korean characterization of the deal. The Singapore accord largely amounts to an agreement to continue discussions, echoing previous public statements and commitments. It does not, for instance, include an agreement to take steps toward ending the technical state of warfare between the U.S. and North Korea. Nor does it detail plans for North Korea to demolish a missile engine testing site, a concession Trump said he’d won, or Trump’s promise to end military exercises in the South while negotiations between the U.S. and the North continue. Trump cast that decision as a cost-saving measure, but also called the exercises “inappropriate” while talks continue. North Korea has long objected to the drills as a security threat. It was unclear whether South Korea was aware of Trump’s decision before he announced it publicly. U.S. Forces Korea said in a statement Tuesday it was unaware of any policy change. Trump phoned South Korean President Moon Jae-in after leaving Singapore to brief him on the discussions. Secretary of State Mike Pompeo flew to Seoul Wednesday for follow-up meetings. The Pentagon said Tuesday it was consulting with the White House and others, but was silent on whether the August exercise would proceed. Mattis’ chief spokeswoman, Dana W. White, told reporters he was “in full alignment” with Trump. Lawmakers, too, were looking for details. Republicans emerged from a meeting with Vice President Mike Pence wanting more information on which exercises were on hold. Colorado Sen. Corey Gardner said Pence told them that small-scale exercises would continue, but “war games will not.” Pence’s spokeswoman later denied that comment. The agreement’s language on North Korea’s nuclear program was similar to what the leaders of North and South Korea came up with at their own summit in April. Trump and Kim referred back to the so-called Panmunjom Declaration, which contained a weak commitment to denuclearization but no specifics on how to achieve it. But Tuesday’s meeting was as much about theatrics as the details of a deal. The U.S. president brushed off questions about his public embrace of the autocrat whose people have been oppressed for decades. He did say that Otto Warmbier, an American who died last year just days after his release from imprisonment in North Korea, “did not die in vain” because his death helped bring about the nuclear talks. In the run-up to Tuesday’s historic face-to-face with Kim, Trump had appeared unconcerned about the implications of feting an authoritarian leader accused by the U.S. of ordering the public assassination of his half brother with a nerve agent, executing his uncle by firing squad and presiding over a notorious gulag estimated to hold 80,000 to 120,000 political prisoners. In their joint statement, the two leaders promised to “build a lasting and stable peace regime” on the Korean Peninsula. Trump has dangled the prospect of economic investment in the North as a sweetener for giving up its nuclear weapons. The longtime property developer-turned-politician later mused about the potential value of condos on the country’s beachfront real estate. The formal document-signing, which also included an agreement to work to repatriate remains of prisoners of war and those missing in action from the Korean War, followed a series of meetings at a luxury Singapore resort. Ahead of the meeting Trump had predicted the two men might strike a nuclear deal or forge a formal end to the Korean War in the course of a single meeting or over several days. But in the hours before the summit, the White House unexpectedly announced Trump would depart earlier than expected. Critics of the summit leapt at the leaders’ handshake and the moonlight stroll Kim took Monday night along the glittering Singapore waterfront, saying it was further evidence that Trump was helping legitimize Kim on the world stage. Trump responded that he was embracing diplomacy with Kim in hopes of saving as many as 30 million lives. The North has faced crippling diplomatic and economic sanctions for years as it has advanced development of its nuclear and ballistic missile programs. Pompeo held firm to Trump’s position that sanctions will remain in place until North Korea denuclearizes — and said they would even increase if diplomatic discussions did not progress positively.